The area now known as Yorktown Heights was acquired from the Native Americans and later became part of Van Cortlandt Manor. There were farms here and the town’s proximity to the Hudson River allowed residents to ship their goods to New York City. Later on in 1881, a railroad was built through town and farmers were able to utilize this route to New York City as well. The railroad was eventually shut down in 1958. The Croton River, which runs through the southern part of Yorktown was dammed by New York City to provide its first major source of clean and reliable water. The original Croton Dam was in Yorktown and in 1842 it burst causing major damage to the area. The new Croton Dam, was finished in 1905 and was an attraction for many tourists. During the Revolutionary War, Yorktown was a key site due to the Pines Bridge crossing guarded by a regiment of Rhode Island troops made up mostly of African Americans who were massacred at the Davenport House in Croton Heights. A memorial to them is at the Presbyterian Church in Crompond. The British army’s Major John Andre ate his final breakfast at the Underhill House on Hanover Street. Andre was caught later that day in North Salem and eventually hanged as a spy for his collaboration with Benedict Arnold. 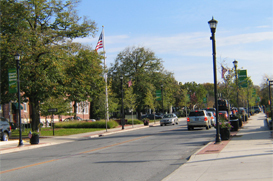 In 1788 the township was officially incorporated as Yorktown, commemorating the American victory in Yorktown Virginia on October 19, 1781. Returning home after the victory at Yorktown, the French Army camped at what is today French Hill Elementary School, cannonballs and other relics have been found at this site. Today the area is still quite wooded and is home to Turkey Mountain, a popular hiking spot. It is home to many communities and some light industry.